These seem popular in many modern knife sets, and I have seen them used (somewhat clumsily) in Europe. Does anyone actually use these to good effect? If so, what is actually gained over a normal knife? Which type (single or double blade) and size does this apply to? 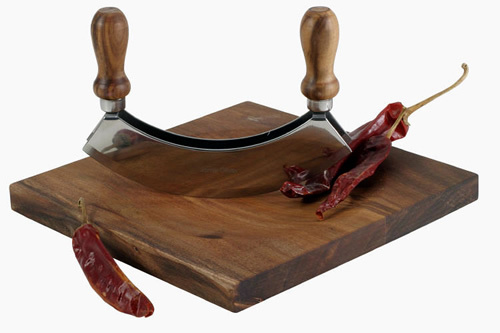 no need for gloves when cutting foods that can irritate the skin, like chillies. Awkward and dangerous to wash in between the blades for the double-blade version. A unitasker really only suited for chopping herbs and spices. The most common items chopped in many cuisines, onion and garlic, would require rough chopping first with a traditional knife, making it hardly worth it. Inhibits the development of valuable knife skills. I bought my first mezzaluna because I have advanced arthritis and can no longer use a chef's knife properly. It's an absolute lifesaver being able to push down with the strength of both hands instead of relying on a weakened arm with a wrist that doesn't bend attached to a clawed hand that cannot grip a knife the right way. My "go-to" knife is a fairly large mezzaluna (for me at least, it's an 8" single blade and my hands are child-small) and I do use it to chop everything from meats to vegetables. About the only things I can't do with it are fillet fish and break down chicken. I also have a smaller double-blade for herbs and garlic. Obviously, many of the tasks I use it for are better suited to a chef's knife but as that is not an option anymore, my mezzaluna is incredibly versatile and without it I don't think I could accomplish much in the kitchen. I recommend mezzalunas to anyone who finds a chef's knife painful or can no longer grip one properly. There's a bit of a learning curve but you get used to it quickly. These are most useful for things like large bunches of leafy herbs (they are often sold as herb choppers) or a pile of nuts to be chopped. You can also find very large ones used for cutting pizza. However, if you have a decent, large, sharp, chef's knife and know how to use it, you can do just as good a job without one: it depends how many gadgets you like lying around the kitchen. I almost gave my mezzaluna knife away... but decided to give it a try and now I LOVE - LOVE - LOVE this knife!!! I have a single handle, single blade mezzaluna with a square chopping board that is rounded out (bowled)to fit the knife. I chop everything from garlic and herbs to fruit and veggies. The board and knife keep everything from falling or flying all over. When mixing several different fruits,veggies and/or herbs into a single dish (usually 2-6 servings), you can chop most or all of them at once! Cut a small amount of your ingredients, move over or to one of the corners, get more or your next item, chop and slide it over, and so on. When board is nearly full or you have all your ingredients cut, put board over your pan, scrape all ingredients in (if more are needed, repeat)... then your ready to start cooking!!! SIMPLE and FAST!!! Not only does this save a ton of time and clean-up, I almost always choose this over my food processor or nut chopper because I love the 'organic' feel to chopping up all that stuff by hand! Granted, this is more "utilitarian"; chopping quickly and easily. For cutting more precise or 'pretty' pieces of fruit or veggies, I'd choose a different knife. But once you get the hang of the rocking motion, and find just how much time you will save, I think you will really like using it! *just make sure to also get the "bowl" type cutting board and as good a quality knife as you can afford. I have one, a single-bladed and I use it to cut pizza. It's 22 cm (8.5") from the middle of the one handle to the middle of the second handle in a straight line, and 27 cm (10.5") if you follow the curve of the blade. It's a very easy way to cut a pizza, but unless you eat pizza often, it's not worth the cost in my opinion (I got mine for free), although I have no idea how expensive they are. I must admit that I prefer it over a pizza cutter myself. The reason for that is that you can put more pressure on it. One clean cut and you're through. It's also possible that I've only worked with lousy pizza cutters, that wiggled if you put a bit of pressure on them or that weren't very sharp. 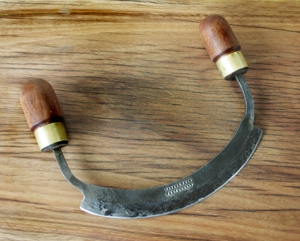 If u make a lot of chimichuri .and want to do it right,this is the proper tool. parsley needs to be chopped very fine and inlarge amounts so in order to do without your arm falling off a mezzaluna is needed. I have a single handle Mez. knife I could never figure out how to use until I began to eat chopped salads. Using the knife in a somewhat shallow hardwood bowl is perfect for chopping salad fixings.